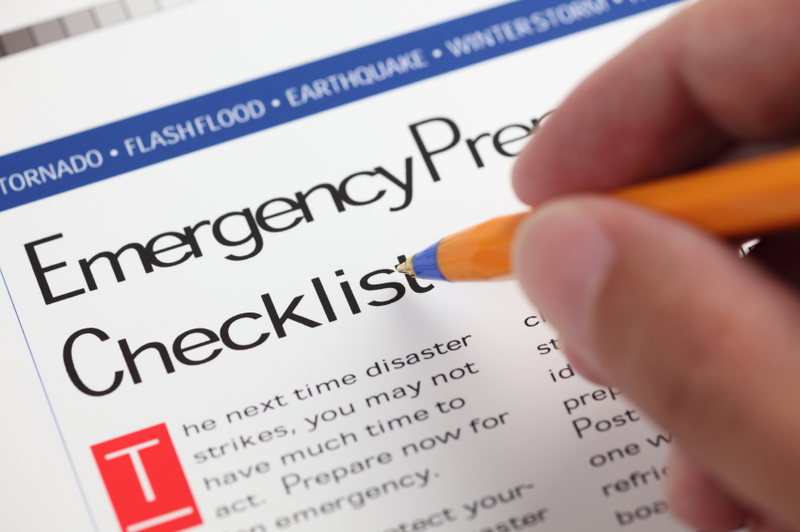 In my previous National Preparedness Month blog, I encouraged you to review what preps you’ve made in the past year and consider strategic purchases to improve your preparedness position. Some of you know off the top of the head what your highest prepping priorities are, but for most of us, I’m guessing a more directed approach to evaluating your preps would be helpful. We’re here to help. Use the Preparedness Check and Challenge checklist below to evaluate where you are now and where you want to be. There are more areas in which we need to prepare – communications, transportation, and medical, to name just a few. But our readers tend to be beginners in prepping, so we’ll stick with these basic topics for today’s blog. We’re still working on every area (of course), but we’re making progress. My personal challenge for September is to complete a 3-day and a 1-month food plan with recipes. As I was writing this blog and explaining my alternate approach to evaluating my stored food, I realized that I can easily look at my pantry and evaluate if I have the necessary food to meet my immediate and short-term needs. Today, that is. That wouldn’t be the case in an emergency. You see, cooking is a weakness for me. Phil can grab ingredients and make good food. I can’t. I used to become paralyzed in video rental stores – there were just too many options. I also become paralyzed when faced with an immediate need to make food if I don’t have a plan. So, by the end of September, I hope to have several written menus for the first three day s and first month of an emergency, and make sure that we keep all the ingredients on hand to make those meals. If we don’t have the ingredients in stock, the menu plan isn’t worth anything. Let me urge you – spend a few minutes reading this brief checklist, then challenge yourself in one area. Set a specific goal of what you want to accomplish before the end of September (National Preparedness Month). That’s only two weeks away, so be reasonable about what you might be able to do, but don’t be too easy on yourself. The harder you work now, the easier you’ll have it when you need it. Recommendation: The government recommends 1 gallon per person (and pet) per day for drinking and cooking. We say more is better, but 1 gallon is a minimum place to start. Oh, and if you want to keep yourself and your things clean, plan on needing more water. What are you going to do to upgrade your water storage and/or purification capabilities? Recommendation: The average adult intake is about 2000 calories/day under normal conditions. In an emergency, you’re likely to be burning more calories than that, so if you can plan for 3000 calories/day, that’s a good thing. Don’t forget pets. If you have pets, how much do they eat each day? Multiply that by the number of days and you know how much pet food you need to have stored. Immediate: How many meals can I make with little or no preparation in the first 72 hours? My goal is 3 meals per day for 6 people. I can easily look at my pantry and determine if I am at that goal. Short-Term: How many meals can I make from my pantry with minimal dipping into my long-term storage food during the first month? My goal is 3 meals per day for 8 people, with some desserts added to help keep up morale. Again, I’m going to visually inspect my pantry to determine if my goal is met. Long-Term: How much long-term food do I have? Phil and I met our one-year plan for the two of us last year, so now we look at how many other people can we help. Do you know how to cook the food you have with the cooking method(s) available? If for any reason your current shelter is no longer available, do you have a backup plan? Where will you go and how will you get there? What kind of challenges are you likely to face in getting there? What will you take with you? What do you need to be able to make the trip? How quickly can you be on the road? In a no-power-grid situation (whether it’s from a snow storm, a tornado, a hurricane, or a power-grid failure) do you have a plan to keep you family warm? Start with buying extra clothes and blankets. Add to it by developing an alternate heat source. Are you prepared to protect your family? What do you need to do to become more prepared and better trained? How’s your prepper notebook coming? Read more about it here. 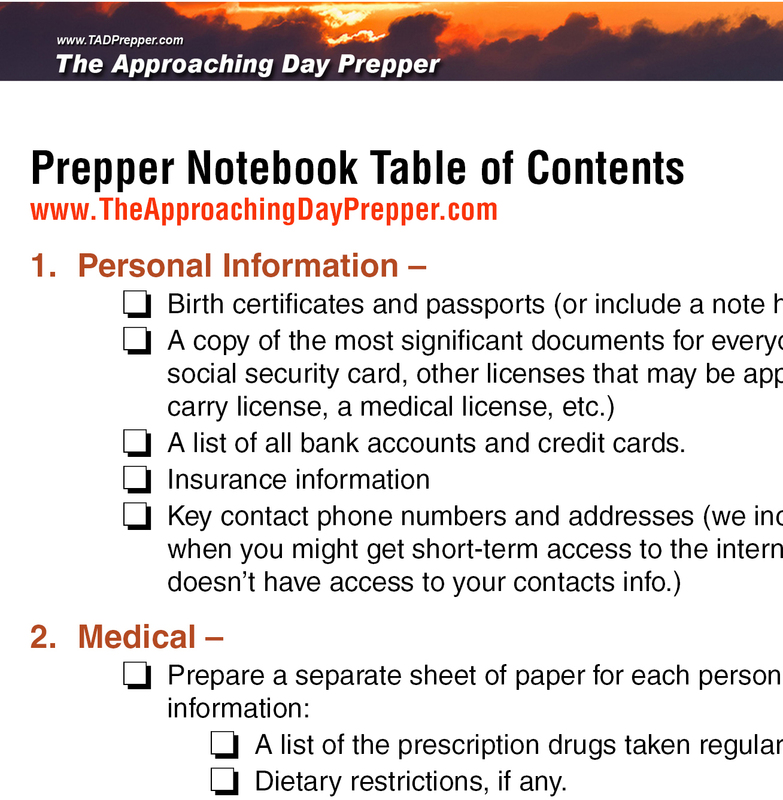 People tend to put off gathering important documents and creating a prepper notebook. If this is the one thing you do during National Preparedness Month, you will have done a good thing. What’s your Preparedness Check and Challenge goal for this National Preparedness Month? The holidays have come and gone…most of us have gotten back into the real world despite the crazy weather we’re having across the country. It’s time to think about 2014. Some people take a mini-retreat in December to do this, but that just doesn’t happen for most of us. So I want to encourage you to do some planning this week. Find a little bit of time to think ahead toward all that 2014 holds and set your priorities for the coming year. And be sure that part of that planning includes your prepping efforts. Phil and I did it Sunday evening and we are really glad we did. Phil is by nature a non-planner, so when I suggested we actually use this calendar I created as a result of my blog about Living from a Prepper Perspective…well, let’s just say it was one of those “yes dear” moments. He was gracious enough because he’s a great guy, but in his heart of hearts he felt like he was about to swallow some horrible-but-good-for-you medicine. Before we were done, however, he was a believer. He agreed that the whole experience was positive. And we were all done in just about 30 minutes. We started by listing all the things we wanted to accomplish, buy, or learn in the area of prepping in 2014. We know that our list is greater than our ability for the most part, but making the list allowed us to put things into three categories based on their cost in terms of time, effort, and money. Easy-Peasy – These are tasks or items that are simple enough, we just haven’t gotten around to doing them or buying them. They are things that are affordable on our “every day” budget. We expect we’ll be able to buy these items out of disposable income some time during the year. Requires Moderate Planning/Effort – These are tasks that are outside of our every day budget but do-able if we plan for them. They’re also tasks that might require more than a few hours to accomplish. Requiring more time means they’re not going to fit into my week without planning for them. This is the category that will get the most attention on our calendar because they’re the things we can do if we’re aware of when they need to be done, how long they’ll take to do, and make room in our schedule to include them. Without the planning they probably won’t happen. That makes them the tasks and purchases that will benefit the most from using a calendar. Wish List – Our wish list holds items that are so expensive they would keep us from doing much of anything else. Phil and I have two things in this category and we agree that buying the long list of other things is more important to us at this time. Still, putting these expensive things on our list will help keep us focused should we receive unexpected income throughout the year. It will also be a reminder each time we’re tempted to splurge on something else. We can make an informed decision about splurging or saving, instead of just letting impulse reign. Splurging is good sometimes. Other times it’s just squandering the resources God has given us, and derailing the plans that we made in a more rational moment. But I digress. 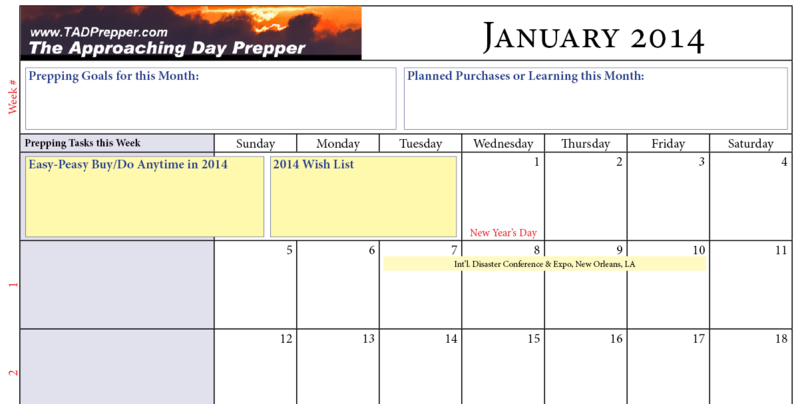 So, with our freshly made to-do and to-buy lists in hand, we pulled out the 2014 Prepper Planning Calendar (which you can download below) and began to slot things that are time sensitive into their appropriate months. For example, we want to plant more raised-bed gardens this year. That means we need to build them in April so we can plant in May. We also want to build a cold frame to extend our growing season. That got scheduled for late July or early August. After we put all the time sensitive tasks into our planning calendar, we slotted other tasks and purchases in other months, balancing both the time commitment and budget as well as we could. After just half an hour or so, we had our 2014 Prepping Planning Calendar completed. Even better than that, we both felt a greater peace and confidence in our ability to accomplish more in the coming year without blowing our schedule or budget. We have a balanced plan for spending our time, effort, and money throughout the year that takes into consideration seasonal fluctuations in our availability and finances. If our income or our schedule changes, we can easily adjust the schedule. I’m guessing your weeks are something like mine…Mondays quickly become Wednesdays, and then Wednesdays becomes Fridays. We step into Saturday with a list of errands and then celebrate the Lord’s Day. Before we can blink it’s Monday all over again, and yet another week has gone by without me doing those prepper tasks I had hoped to accomplish. Our prepper calendar will help us move forward instead of just spinning our wheels. I’m looking forward to 2014. It is a year that holds the promise of many things. I anticipate that it will have its ups and downs but I’ve learned that in both we can experience God’s blessings. Let me encourage you to spend a little time thinking about 2014. You can use this calendar to document your prepper plans. There are pages for each month…more or less. You’ll find that the pages don’t strictly follow calendar months – why waste a whole row if there are only two days in a week during that month? To provide more space for writing you’ll find some days from the previous or following months on your calendar page. You’ll also find pages to do the initial planning. You can download your calendar below. Don’t be surprised if after entering your email address it seems that the blog has reloaded. Simply scroll down to the point and you’ll be able to download the calendar. Enjoy your planning time, friends! And here’s to a prosperous, healthy, and productive year in prepping. Start a Prepper Notebook – Today! When the world changes, one of the most significant things that could happen is that your computer will no longer work and/or you will no longer have access to the internet. For many, many people (me included) this will be a huge lifestyle change. My life is stored on my computer, and over the past year there have probably been less than a handful of days when I haven’t accessed the internet. That includes vacations. On most days, I access the internet many, many times. I suppose I should be more clear here — any and all digital devices may not work. I’m not just talking about your desktop or your laptop, I’m also talking about your tablet, your iPad and your smart phone. By the way, if none of those things work, it’s also likely that your car, your clocks, cable or satellite TV, your ebook reader, and all other electronic devices won’t work either. So start your prepping efforts by committing to maintaining some manual records. Start a notebook. Keep your most critical information in it. Yes, it’s important to learn the necessary skills and practice using them…but my guess is that you live in the same world as me — a busy, busy, busy one. I don’t have time to learn all the skills I want to learn, let alone practice them regularly. And things we don’t practice we don’t remember. Repetition is the key to learning. And when we’re under stress, we remember even less. So start a notebook. A 3″ 3-ring binder or a series of smaller binders. I personally prefer multiple smaller binders. A little time to get started – an hour will give you a good start, two will get you further. Our Table of Contents can be downloaded here. Your notebook should include information about the preparations you’ve made as well as instructions that will help you live in a world that has drastically changed. For example, having a wonderful pantry of dehydrated food stored won’t be very helpful if you don’t know how to cook with it. You’ll want to include recipes for cooking with your dehydrated food. Imagine that the world of googling is gone. What information do you still want at your fingertips? A list of all bank accounts and credit cards. A list of the prescription drugs taken regularly. A copy of their living will and/or healthcare power of attorney (or a note about where it’s kept). This could help you avoid very difficult situations in an emergency. Basic first aid instructions or a reference where to find the information (such as the “Boy Scout Handbook” you have on your bookshelf”). A list of the food you have stored. You’ll want to maintain a record of the long-term storage food purchases you make. Most people will keep those records on their computer. Periodically or when you make major purchases, simply print out a new summary for your notebook. Recipes for using your long term storage food unless you’re familiar with cooking with the food you’ve stored. Even if you know how to cook with your food without recipes, having them in the notebook could be a big help because in a disaster you may not be available to do the cooking. You may be injured or stuck in some other location. Do those left at home a favor by having recipes that will help them use the food you’ve stored. Gardening/farming helps. We’ve started gardening, but we don’t yet know when is the best time to plant each item in our garden or how long we can expect before harvesting. If you’ve stored heritage seeds, you can include their location. Prepper How To’s – There are so many things you’ll want to know how to do if the world ceases to exist as it is today. For example, if we lose gas and/or electricity for an extended period of time, I’m going to want to know how to build a rocket stove since I haven’t made one yet. I also want to build a solar oven but haven’t done it yet. Those instructions go in the How To’s section. You might also want to include recipes for things you typically buy but may need to make in a disaster (such as soap, candles, etc.). This section could get really blown out and may become several notebooks of their own, but start with just one section in your first notebook. List of people with skills you may need in an emergency. Include contact information. List of key websites you can access for information or help. If you have internet access you don’t want to waste precious time, power or accessibility doing google searches for that site you always visited for info. List of key local and national organizations and contact information. List of people with whom you can barter for needed supplies or services. List of local resources such as natural springs or farms. Don’t wait until you have everything you need for your notebook, just get it started. Once it’s started, you can add to it, delete from it, etc. For example, in the recipes section, just put the first 5 recipes you find into your notebook. Don’t wait until you’ve evaluated them or you may never get them into your notebook. I’ve spent too long saying “Well, I don’t want to put the recipe in my notebook until I’ve tried it.” That’s foolish thinking. Just put it in. When you get around to trying it, you can always change or delete it. But if a disaster occurs before then, you’ll have something in your notebook! Download our Prepper Notebook Table of Contents here. It will help you get started. We’ve provided it as both a PDF and a customizable Word file. This is not something you create and then put in a drawer. It is a living, breathing document. Update it often.